So, we're starting the ketogenic diet with Evelyn. I'll detail that in a separate post. Particularly because she's a baby, we have to be very precise in how much food (a special formula - KetoCal) we give her on the diet, as it's a delicate balance of ketosis to be maintained, plus we don't want her to actually lose weight. Thus, a precise scale was recommended by the dietitian; one that can measure in tenths (0.1) of a gram. While these can be procured online, brick-and-mortar stores carrying them are harder to find. We didn't want to wait for a shipment, as we wanted to go ahead & get things going. Moreover, Kim wanted a smaller-sized scale - e.g. easily portable or what-not - so if we had to feed Evie "on the road" - it could be done. So, I was tasked with procuring one from one of few the stores known to carry very precise scales (and recommended for this reason by the dietitian!) - a "Department Store" which shall remain nameless. I couldn't even find a website for them, but they're a local chain here in Phoenix, as best I can tell. And they're not your "usual" department store - no lady's and housewares (though there might've been a jewelry section!). They are a ... "pipe store". Or "smoke shop". Or "counter-cultural and related paraphenalia store". So, I walk in on my lunch break (e.g. dressed for work), and was immediately on sensory overload between the burning incense, giant wall o' bongs, tye-dye everywhere and the Dead playing not-so-softly in the background. So I asked to be directed to the scales, to which I was gladly pointed. I ask the kind "salesman" for help in choosing a scale that was precise to the tenth of a gram, was reasonably small, but also wasn't too pricey. He recommended a few models, but then he posed a question (or a point) that we hadn't considered: How much weight would we need to weigh? E.g. what was the upper-limit of the scale? To complicate things, because it was all quite precise, we're going to be mixing Evelyn's food up all at once. So, we're talking about a whole day's worth of food, not a single feeding's worth. The model otherwise seeming to most meet our needs only went up to 600 grams. I had no idea what 600 grams looked like or felt like; I'm not a metric guy! ;-) The "salesman" pulled out some calibration weights, in 200 gram increments. This helped a little, but was deceiving, since they're quite dense, as compared to the KetoCal formula. While I was pondering this and calling Kim to ask how much food we'd have to weigh at once for Evie, my first "salesman" got preoccupied with another fine & upstanding customer. I got off the phone with Kim, and was still pondering the scale, when another "salesman" walked up. Now, I hate to call anybody a dirty hippie, because I know plenty of good, upstanding & most importantly clean hippie-types, but... this guy was a dirty hippie; dread-locked & just... dirty (literally). ;-) I labor at all this description only so you'll fully appreciate the hippie "dude" expression, said as only a hippie can say it. He sees me really quite consternated over this scale, so I explain that "I'm just not sure if I'll need to measure more than 600 grams or not." Me: "Oh, yeah... well... I'm not trying to measure what you guys... normally might measure with this." Me: [ignores look] "Yeah; I'm trying to measure food with it." Him: [finally asks, gesturing with his hands an approximate size] "So... like... how much are you trying to measure?" Me: "Well, it's baby formula - so it's ...." [I stop short as I realize I'm about to describe it as "a fine white powder"] "...well, see, my 4-month-old daughter has a seizure disorder. So there's this special diet that she has to go on, but we have to be very precise with how much she gets, as it's a delicate balance of the diet controlling the seizures and keeping her from losing weight. See, the diet puts your body into ketosis - just like the Atkins diet - which produces amino acids which bind with certain proteins in the brain, which - in about 30-50% of the general population with seizures - helps control seizures." Him: [look of "oh-wow-either-that's-cool-or-this-guy-really- put-some-effort-into-coming-up-with-his-excuse"] "Wow... so it, like, stops the seizures?" Me: "Yep; about 30-50% of time." 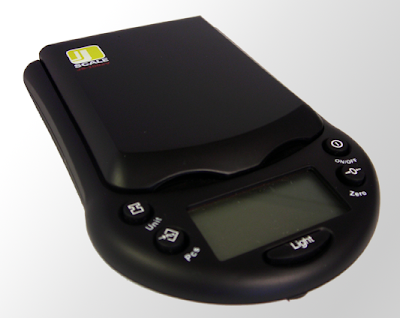 So, long story short, we are now the proud owners of our Jennings JS-600V pocket-sized ultra-precise scale for measuring out our expensive fine white powder. oops, forgot to sign my name. Son my son, this story is hilarious.